$20 | proceeds benefit the Pomerene Center for the Arts. ED HAS CLASS, ANNE HAS FUNK 2017—DESIGNING AN INVERTED CONTEMPORARY CENTERPIECE is an evening of floral arranging. 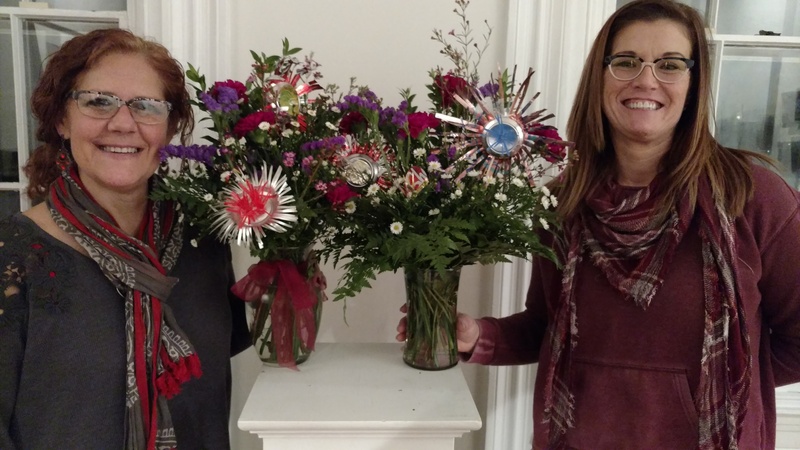 Every year—this is the 5th—Ed Kiefer of Kiefer’s Florist and Anne Cornell of the Pomerene Center put their heads together to come up with the design theme for their ED HAS CLASS, ANNE HAS FUNK floral arranging evening. This year’s challenge—if you want to join in—is to create an inverted contemporary centerpiece. 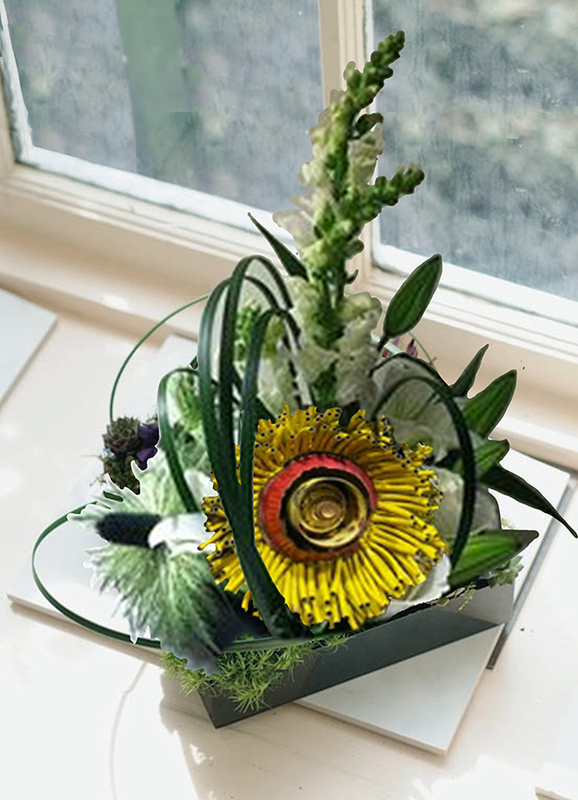 Most classic floral design involves arranging a shape (be it oval, T-shaped, domed, fan-shaped, triangular… ) that reaches ‘out’ into the room. An inverted design, on the other hand, begins with creating a sheltered environment—a little organic room—to showcase a focal bloom. The bloom in this case will be a flower you create using recycled tubing and wires, bottle caps and found objects. The inspiration for this year’s funk blooms comes from Michelle Stitlzein’s Fynbos Series in which she uses recycled hoses as a primary material. Michelle grew up in Coshocton with family roots in the creative industries —Pope-Gosser Pottery and the promotional advertising business (her mother Annette Salrin worked as an artist for Shaw Barton). 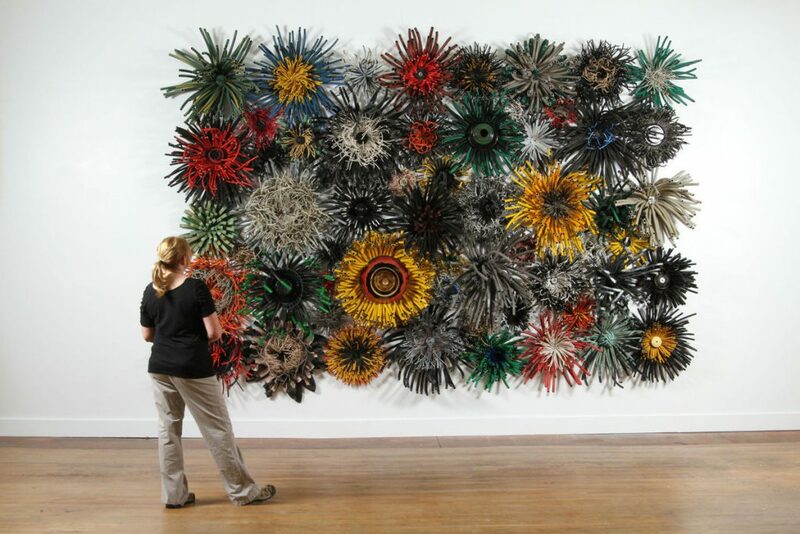 Currently, Michelle Stitzlein lives and works in Baltimore, Ohio where she creates large scale sculpture from recycled materials. The Springfield Museum of Art in Springfield, Ohio is opening a solo exhibition of Michelle’s work on January 21. The exhibit “Industrial Nature” runs through May 28. More info about the exhibit is available here. Want to know about Fynbos, South Africa? Click here. p.s. It’s our hope you’ll lend us your floral artwork to exhibit for the whole community to see at the 24th annual Chocolate Extravaganza, February 11th @ the Coshocton County Career Center.